Dancers perform at the Tamil Heritage Month celebration hosted at U of T Scarborough. Photo by Joseph Burrell. 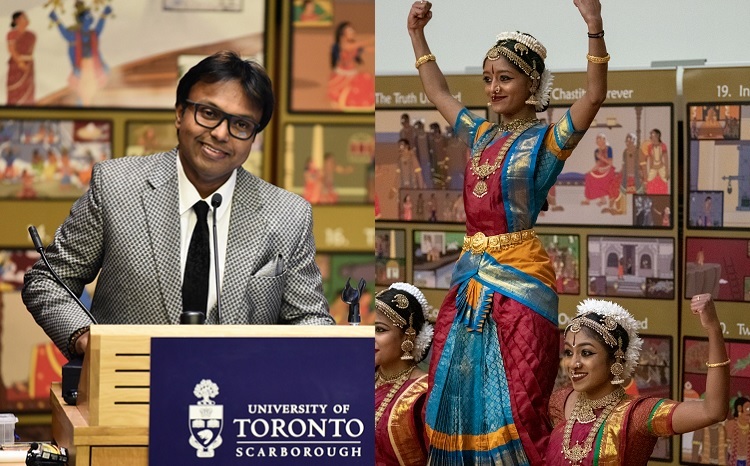 The inaugural Tamil Heritage Month celebration, hosted at U of T Scarborough, supported efforts to develop an academic program for Tamil studies, one of the world's seven great classical cultures. As a volunteer teacher, Tharscika Ramaneekaran remembers a student telling her why she wanted to learn the Tamil language – she could not understand her grandparents. 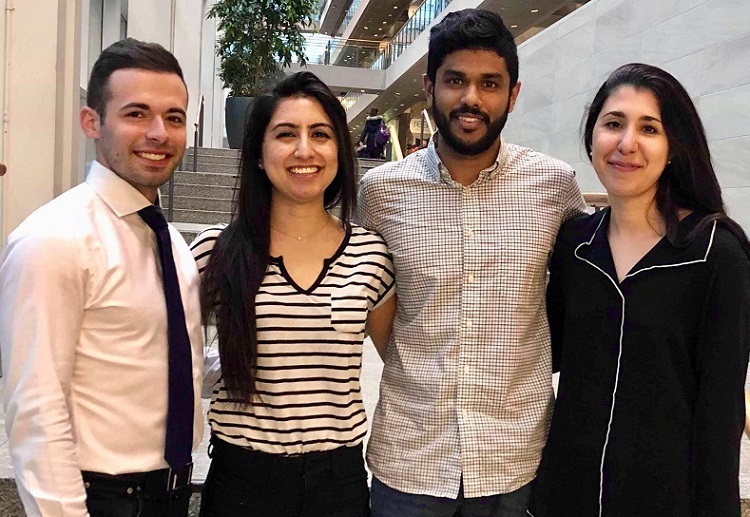 Ramaneekaran, a third-year biochemistry student, said this is why having a chair in Tamil studies at University of Toronto Scarborough is so important. “By having a Tamil chair to do proper research, it’s not just that we can connect with our own culture and language,” said Ramaneekaran, who is also culture director of U of T Scarborough’s Tamil Students’ Association. 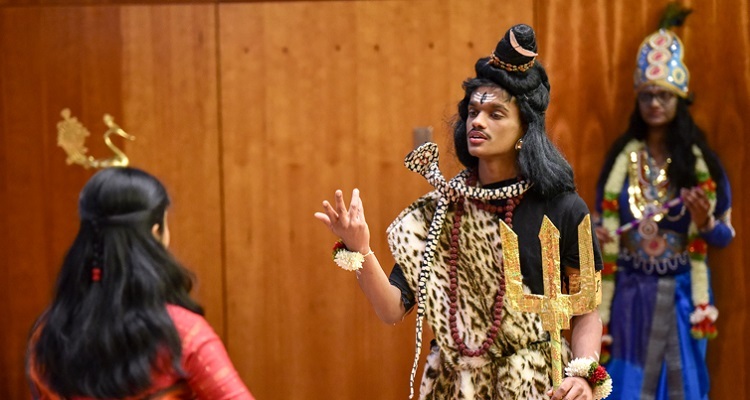 Ramaneekaran was one of several performers at the first Tamil Heritage Month celebration, hosted at U of T Scarborough in January. The event celebrated the Tamil community and was a fundraiser for an initiative to bring a full-time chair in Tamil studies to U of T Scarborough. As of January 21, the efforts by Tamil Chair Inc. and Canadian Tamil Congress had raised $790,000 in pledges and donations for the Tamil chair initiative. 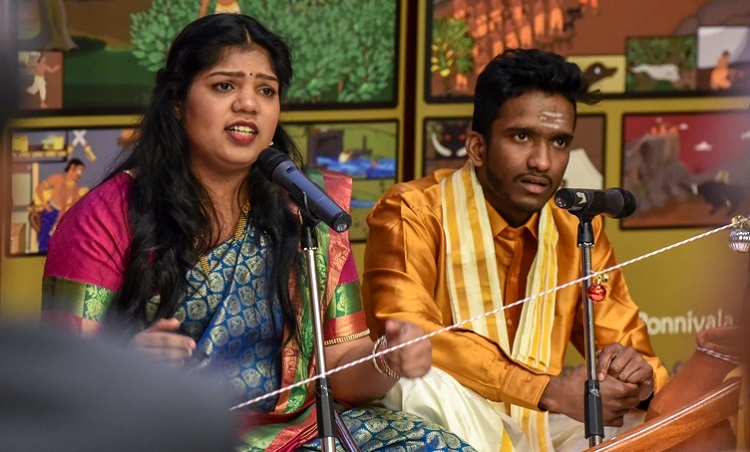 U of T Scarborough student Tharscika Ramaneekaran (at left), culture director of U of T Scarborough’s Tamil Students’ Association, participates in the performance of an epic story at the Tamil Heritage Month celebration. Photo by Joseph Burrell. Tamil is one of the world’s oldest languages. It is spoken by more than 80 million people. But after thousands of years, many physical copies of its rich literature and history are now gone. The Tamil chair initiative will support a distinguished scholar in researching Tamil language, history and culture, and in developing an academic program for Tamil studies at the University of Toronto. The fundraising event was created in collaboration with Tamil Chair Inc. and the Canadian Tamil Congress, two non-profit organizations that pledged $3 million in 2018 toward creating a chair. 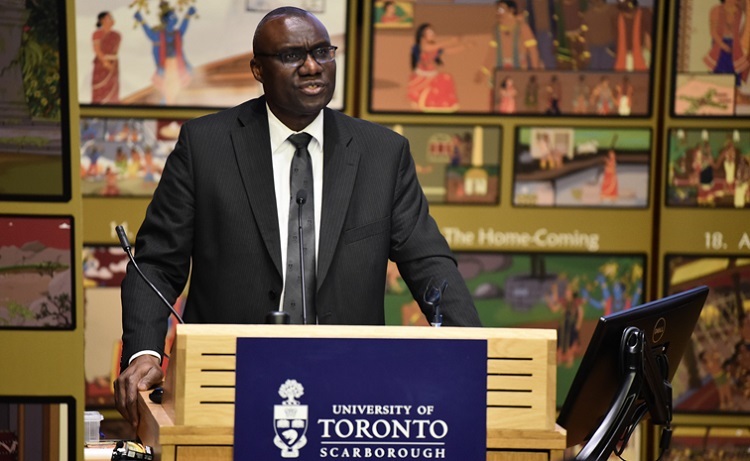 “During this special time, we want to recognize the many contributions Tamil-Canadians have made in our society,” Wisdom Tettey, U of T Scarborough’s vice-president and principal, told the audience gathered at the event. Wisdom Tettey, the vice-president and principal of U of T Scarborough, speaks during the Tamil heritage celebration. Photo by Joseph Burrell. Tamil celebrity D. Imman named Canadian ambassador of Tamil Chair Inc. The night began and ended with dances by Niro Dance Creations, a Scarborough dance school that specializes in classical Indian dance. Their closing dance was a new routine to a new tune — an original theme song donated to the Tamil chair initiative by D. Imman, a famous film composer, music director and singer in the Tamil film industry. “The one thing that unifies all of us right here is because we are all Tamil and for that I feel very proud,” Imman told the audience in Tamil. The night also marked the appointment of Imman as a Canadian ambassador of Tamil Chair Inc.
Imman’s contribution earned him recognition from U of T Scarborough. He was also recognized by local city councillor Jennifer McKelvie and by Vijay Thanigasalam, who was elected to the provincial legislature last year. (Left) Composer D. Imman created a theme song for the Tamil chair initiative. (Right) A new dance choreographed to the song closed the event. Photos by Joseph Burrell. The night’s feature event, a traditional Tamil performance, was used to tell an epic tale. The performance was a Villu Paatu, or bow-song, an ancient storytelling form in which a massive bow strung with bells is struck to create music. It accompanies songs and narration. The songs, music and narration were all written by Shanmuganathan Ramaneekaran, caretaker at U of T’s Hart House and University College. Eighteen performers illustrated parts of The Legend of Ponnivala, the oral folk epic (estimated to be at least 500 years old) from South India. 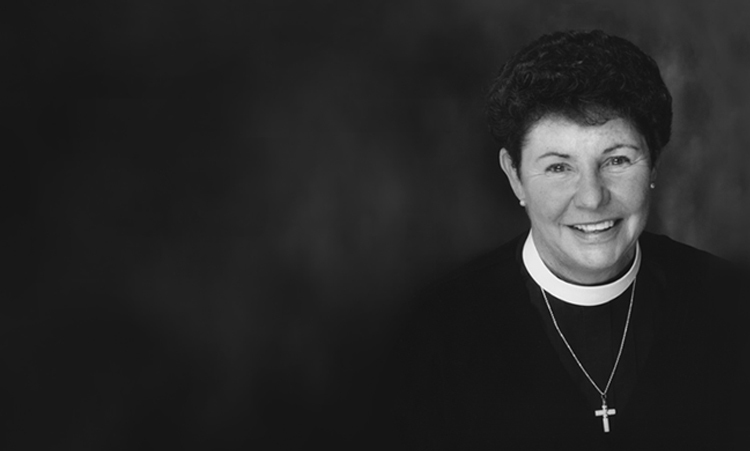 U of T researcher Brenda Beck first brought the tale to Canada and the U.S. in the late 1960s. “I hope this will be the first chair, and the first university, that will expand to give value and importance to the folk traditions of Tamil culture,” says Beck, who was also selling copies of The Legend of Ponnivala at the event, proceeds of which went to the Tamil chair. Actors during a performance of The Legend of Ponnivala, an ancient Tamil folk epic. Photo by Joseph Burrell. Help U of T transform the study of one of the world's great classical languages by supporting the endowed Chair in Tamil Studies.